The Vienne Whiteshield Pigeons – also known by the names: Viennese Whiteside, Culbutant de Vienne à Bouclier Blanc, Wiener Weißschild, Capitombolante Viennese a Scudo Bianco, Венский Белый Щитковый – is one of the old races originating from Vienna (Austria), which developed since the second half of the nineteenth century, but based on existing references, it has been known since 1886. 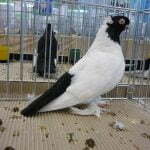 The variety belonging to the Tumbler pigeons type is quite popular and has spread widely in various countries in Europe, especially Germany, Switzerland, Russia and Czechoslovakia – but these varieties are still considered rare. Have good flying ability, and beautiful appearance.